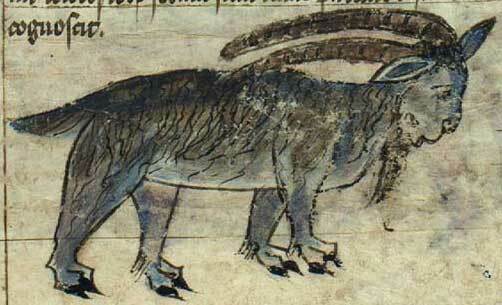 The he-goat is a lascivious beast, known for its lusty nature. This nature makes the he-goat so hot that its blood can dissolve diamond, a stone neither fire nor iron can harm. (DRB) And demons and monsters shall meet, and the hairy ones shall cry out one to another, there hath the lamia lain down, and found rest for herself. (SSE) Y las bestias monteses se encontrarán con los gatos cervales, y el sátiro gritará a su compañero; la lamía también tendrá allí asiento, y hallará para sí reposo. (INR) Le bestie del deserto vi incontreranno i cani selvatici, le capre selvatiche vi chiameranno le compagne; là Lilit farà la sua abitazione, e vi troverà il suo luogo di riposo. (IRL) Le bestie del deserto vi s’incontreranno coi cani selvatici, il satiro vi chiamerà il compagno; quivi lo spettro notturno farà la sua dimora, e vi troverà il suo luogo di riposo. (SRV) Y las bestias monteses se encontrarán con los gatos cervales, y el peludo gritará á su compañero: la lamia también tendrá allí asiento, y hallará para sí reposo. (SRV) Y él pasó al monte de Ephraim, y de allí á la tierra de Salisa, y no las hallaron. Pasaron luego por la tierra de Saalim, y tampoco. Después pasaron por la tierra de Benjamín, y no las encontraron. (SSE) Y él pasó al monte de Efraín, y de allí pasó a la tierra de Salisa, y no las hallaron. Pasaron luego por la tierra de Saalim, y tampoco. Después pasaron por la tierra de Jemini (o de Benjamín ), y no las encontraron. Does every Christian believes this creature as he believes St. Jerome translated and cited in? or that St. Jerome and other owners of other translations are heretics? 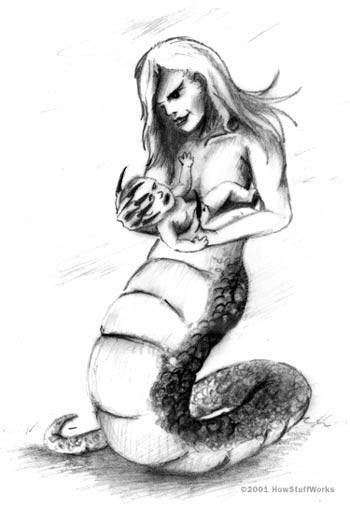 In ancient Greek mythology, Lamia (Greek: Λάμια) was a beautiful queen of Libya who became a child-eating daemon. Aristophanes claimed her name derived from the Greek word for gullet (λαιμός; laimos), referring to her habit of devouring children. Some accounts say she has a serpent’s tail below the waist. (Bishops) There shall straunge visures & monsterous beastes meete one another, and the wylde kepe company together: there shall the Lamia lye and haue her lodgyng. (Bishops) Therfore shall wylde beastes, Lamia, and Cat of mountaynes, and Estreches dwell therin: for there shall neuer man dwell there, neither shall any man haue his habitation there for euermore. The Vulgate is an early Fifth Century version of the Bible in Latin, and largely the result of the labours of Jerome, who was commissioned by Pope Damasus I in 382 to make a revision of old Latin translations. 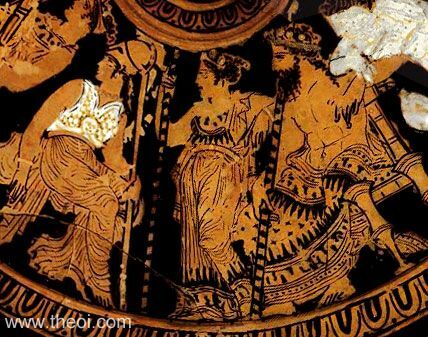 Detail of Zeus and Hera from a painting depicting the wedding of Herakles and Hebe. The gods both hold royal sceptres in their hands. To their left stands Athene. Lilith (Hebrew: לילית Lilit; Arabic: ليليث ‎Līlīt) is a female Mesopotamian storm demon associated with wind and was thought to be a bearer of disease, illness, and Death. R. Hanina said: One may not sleep in a house alone,14 and whoever sleeps in a house alone is seized by Lilith. Rabbah said: I saw how Hormin the son of Lilith was running on the parapet of the wall of Mahuza, and a rider, galloping below on horseback could not overtake him. Rab Judah citing Samuel ruled: If an abortion had the likeness of Lilith its mother is unclean by reason of the birth, for it is a child, but it has wings. So it was also taught: R. Jose stated, It once happened at Simoni that a woman aborted the likeness of Lilith, and when the case came up for a decision before the Sages they ruled that it was a child but that it also had wings. Jewish tradition – Kabbalah : the collective name for the Oral Traditions handed down from generations of Jewish rabbis until the teachings reached the mass populous today. 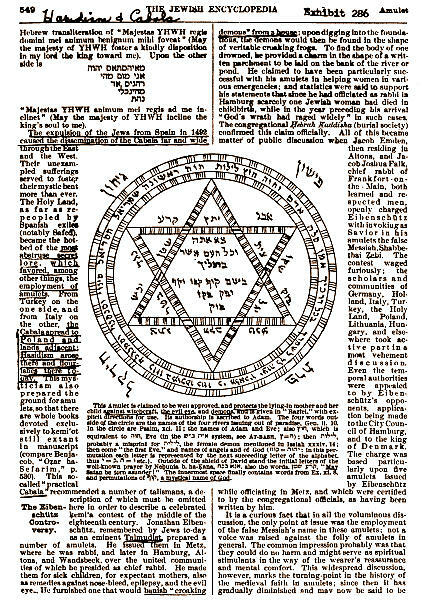 The origin of the Book of the Angel (or Archangel) Raziel originated when G-d had given the knowledge to Raziel (which means “Secret of G-d”) since his mission is transmitter of secrets (“Jewish Encyclopedia,” p 335). 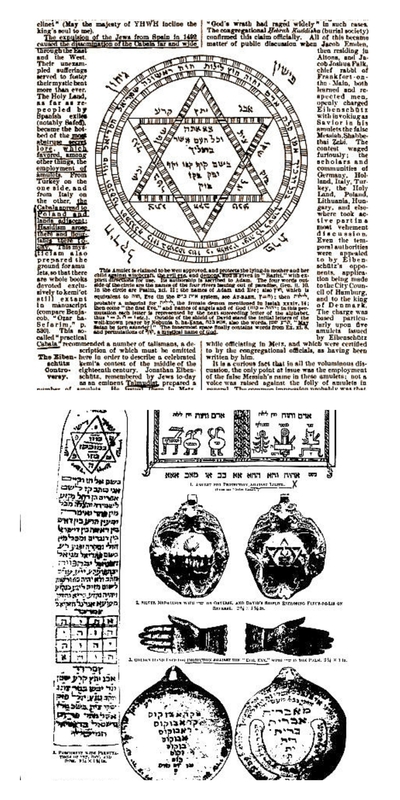 Often reprinted, this popular book of practical kabbalah includes incantations and magical formulae. The opening shows an amulet to protect women in childbirth and newborn infants from harmful spirits, in this case, the spirit of Lilith. According to legend, Lilith was Adam’s first wife (before Eve), but left him when he refused to share power equally. Of the hordes of demons the Jew who would win out must use and dismiss, none is more prominent than Lilith. Some of the amulets meant to keep her in check, as reproduced from the Jewish Encyclopedia, appear in Exhibits 286 and 287. Lilith is supposedly jealous of lying-in mothers and their new-born Babies. When the Holy One, blessed be He,will bring about the destruction of the wicked Rome, and turn it into a ruin for all eternity, He will send Lilith there, and let her dwell in that ruin, for she is the ruination of the world. And to this refers the verse, And there shall repose Lilith and find her a place of rest (Isa. 34:14). The black bile from the spleen corresponds to Lilith. She is under the control of Saturn. She is the melancholy of the nethermost kingdom of the dead, of poverty, darkness, weeping, lamentation, and hunger. In Greek mythology the satyrs are deities of the woods and mountains. They are half human and half beast; they usually have a goat’s tail, flanks and hooves. While the upper part of the body is that of a human, they also have the horns of a goat. They are the companions of Dionysus, the god of wine, and they spent their time drinking, dancing, and chasing nymphs. 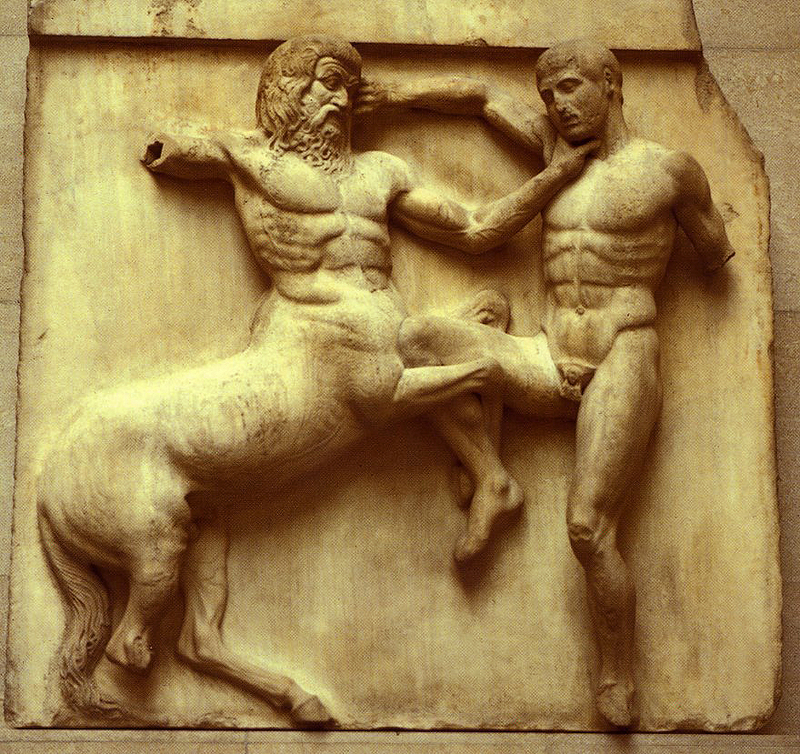 The Italian version of the satyr is the faun, while the Slavic version is the Ljeschi. Satyrs are known for being creatures that were half men half goats with Pan as their leader but also followers of Dionysus. 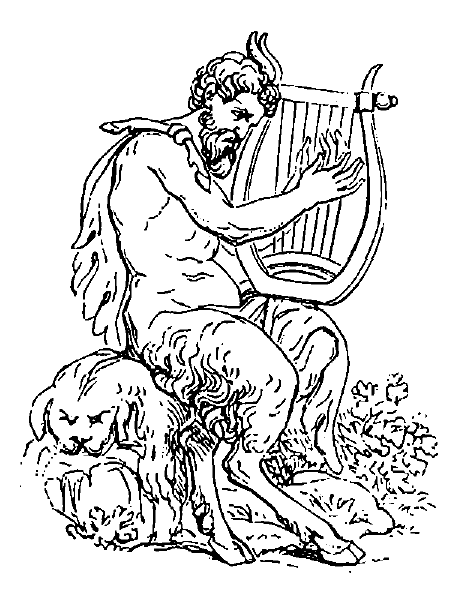 From their play the tragedy (=goat-song) originated according to Aristotle. Isa 34:14 The wild beasts of the desertH6728 shall also meetH6298 withH854 the wild beasts of the island,H338 and the satyrH8163 shall cryH7121 toH5921 his fellow;H7453 the screech owlH3917 alsoH389 shall restH7280 there,H8033 and findH4672 for herself a place of rest.H4494. Unfortunately we have found books alleging it holy books inspired by God, contain things have no presence reality, and they are all pure myth and legend rather than have any connection with the fact. Mythical creatures are almost always literary creatures that generated popularity out of literary circulation and story-telling. They are legendary creatures that at one point were believed to be real beings, while some have their origin traced from literary myths. 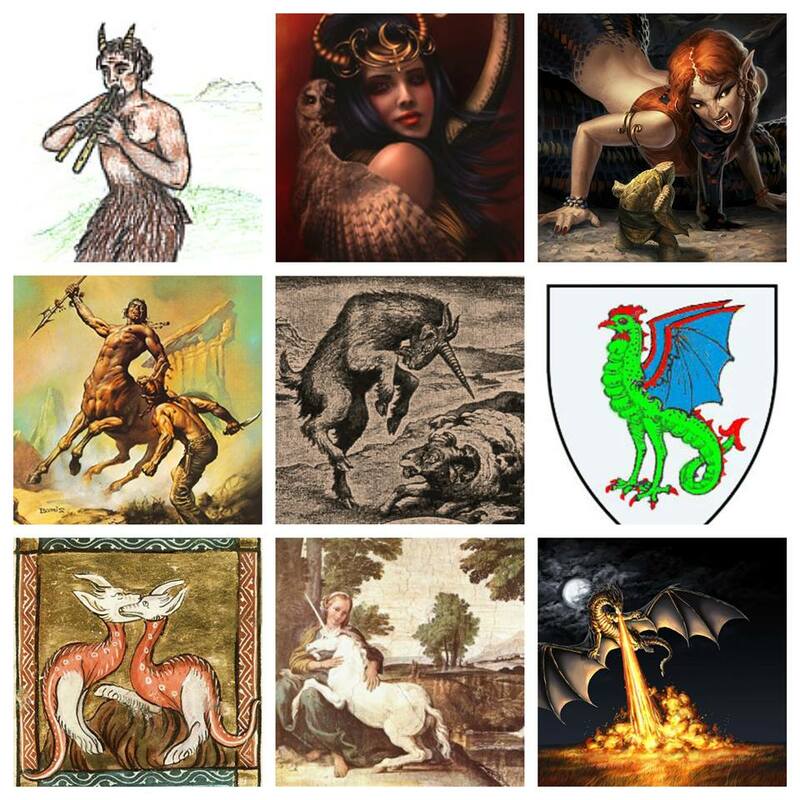 Mythical creatures can be divided into two groups; the first group consists of creatures that everyone agrees to have existed or still exist today and the other group is composed of creatures in which not everybody agrees as to whether they have existed or not. While the first group is asserted only on literary works and word of mouth, its impact becomes stronger over time. The tale becomes a legend and is passed down through generations resulting in the myths that exist today. Is the Bible that we have in our hands today unchanged? Or has it undergone extensive revisions and alterations? Truth is the first victim in the Christian apologetical literature. This is because if they tell the truth about the Church history and its role in formulating the Bible (or Bibles) as well as the manuscript tradition of the New Testament, belief in the Bible as the “Word” of God would take the beating and the Churches would go absolutely empty. Hence it is not be surprising to find an average Christian’s knowledge about his own scriptures is pretty close to zero. The phrase which colored blue has been omitted by the DR, RV, Ne, NIV, NKJV marg., RSV, GN, LB, NASV, NEB, NWT, JB. AMP italicised the words. Finally the manuscripts prove corruption and the purpose to make Jesus as second hypostasis. Christians are fond of claiming that Jesus fulfilled Old Testament messianic prophecies, but as i mentioned last article. The writers of the New Testament books often twisted verses from the Old Testament that had nothing to do with messianic prophecies. The phrase which colored blue have omitted by is omitted by the RV, Ne, NIV, NKJV marg., RSV, GN, LB marg., NEB, NWT, JB. AMP italicises the verse, NASV brackets the verse. 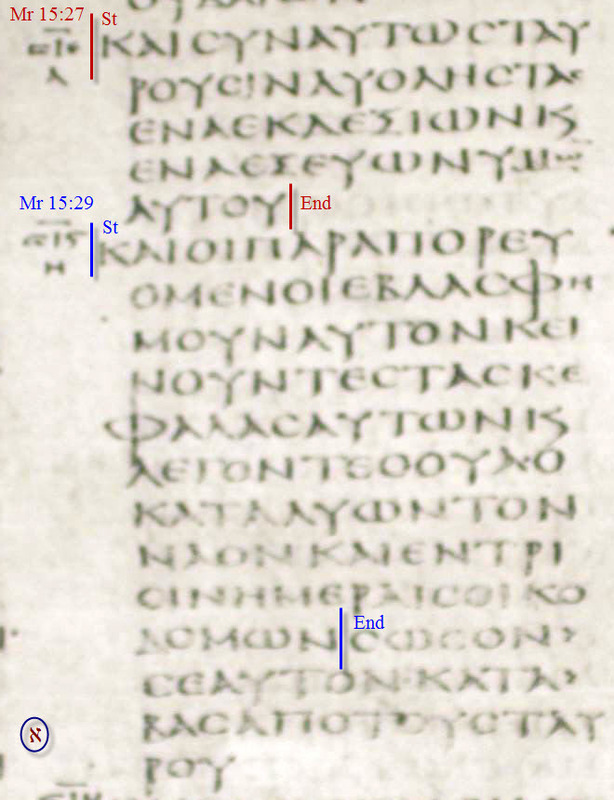 As we see the text contains a quotation from one of the texts of the Old Testament which is found in Isaiah 53, specifically verse 12: therefore will I divide him a portion with the great, and he shall divide the spoil with the strong; because he hath poured out his soul unto death: and he was numbered with the transgressors; and he bare the sin of many, and made intercession for the transgressors. But what ancient documents of the Bible said on this passage? 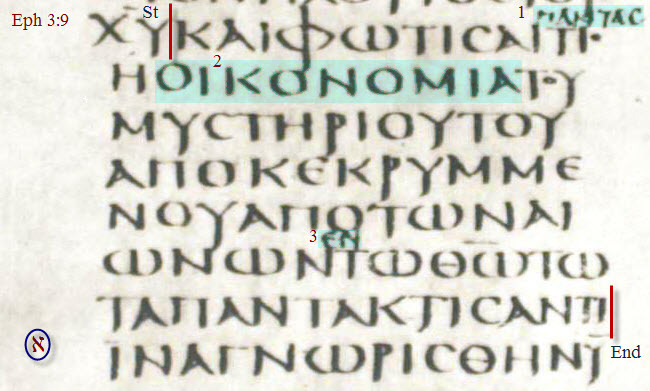 In a textual commentary on the greek New Testament by Metzger, Bruce M said: The earliest and best witnesses of the Alexandrian and the Western types of text lack ver. Christians missionaries must aware of this, Bible contains thousands upon thousands of manuscripts, the textual variants include mere spelling mistakes, doctrinal differences, as well as intentional additions and omissions, for example. This testimony not considered valuable, so the text is not authentic. According to Jesus admissions, shall be split in two sections. The first shall be the biblical prophecies that were made in order to identify the messiah. The second shall be the prophecies that Christians use to say that Jesus was the Messiah, yet they clearly fail. και επι τον ιματισμον μου εβαλον κληρον. But what ancient documents of the Bible said on this verse? That it might be fulfilled which was spoken by the prophet, saying, They parted my garments among them, and upon my vesture did they cast lots – The whole of this quotation should be omitted, as making no part originally of the genuine text of this evangelist. It is omitted by almost every MS. of worth and importance, by almost all the versions, and the most reputable of the primitive fathers, who have written or commented on the place. God has preserved so much evidence to disprove the Bible as an authentic preserved and trustworthy text. Why Obstruct Those Who Believe from the Path of Allah? Say: “O people of the Book! why reject ye the signs of Allah when Allah is Himself witness to all ye do? O ye who believe! if ye listen to a faction among the People of the Book they would (indeed) render you apostates after ye have believed! And how would ye deny faith while unto you are rehearsed the Signs of Allah and among you lives the Apostle? Whoever holds firmly to Allah will be shown a way that is straight. O People of the Book! there hath come to you Our Apostle revealing to you much that ye used to hide in the Book and passing over much (that is now unnecessary): There hath come to you from Allah a (new) Light and a perspicuous Book. Wherewith Allah guideth all who seek His good pleasure to ways of peace and safety and leadeth them out of darkness by His Will unto the light guideth them to a Path that is Straight. O people of the Book! now hath come unto you making (things) clear unto you Our Apostle after the break in (the series of) Our apostles lest ye should say: there came unto us no bringer of glad tidings and no warner (from evil): but now hath come unto you a bringer of glad tidings and a warner (from evil): and Allah hath power over all things. 1) If you are right then there is no need to get angry, and if you are wrong then you don’t have any right to get angry. 2) Patience with family is love Patience with others is respect Patience with self is confidence. 3) Never think hard about the past. It may bring sorrow. Don’t think more about the future. It may bring fears. Live this moment with a smile. Trust in Allah. 4) Every test in our lives makes us bitter or better. Every problem comes to make us or break us However, the choice is ours, whether we become victims or victorious. 5) Search for a beautiful heart and not a beautiful face. Beautiful things are not always good, but good things are always beautiful. Love each other for the sake of Allah.